I have been fortunate in witnessing first hand the work volunteers & staff do @ Little Flower Catholic Charities, person in charge, ( Ms Donna Potter ) is extremely organized & efficient with outstanding skills, an individual in charge in receiving foods etc and keeping that well organized & clean for center is Ms Annie Crisafulli ( simply Awesome) truly no words for this incredible lady, and she goes beyond her job description, these two individuals keep this center running smoothly, Mr Ronald Cushing (Case Worker), makes sure center has breads,pastries etc from stores who donate these, he travels to pick these items up & brings them in each morning center opens , no matter what weather is,,as well as checking in clients and doing intakes .... assistance provided @ this center is food pantry & clothing center, employment counseling, resource referrals, an organization anyone would truly enjoy coming into, just awesome period !! . Your opinion matters. Leave A Review Or Edit This Listing for Catholic Charities - Little Flower Emergency Assistance Center. We provide food and clothing, employment and financial counseling, and referral help for people and families in need/ emergency situations in the Aurora area. We are located 1 block south of Colfax on Lansing ave just behind STRAIT lumber. PICTURE ID - The driver's license may be from Colorado or another state. Examples: Driver's license, work ID, Dept. of Corrections ID, Recreation ID card, etc. CURRENT PROOF OF ADDRESS - Example: a bill from a utility company, a phone bill, etc. We always need more information on our pantries. 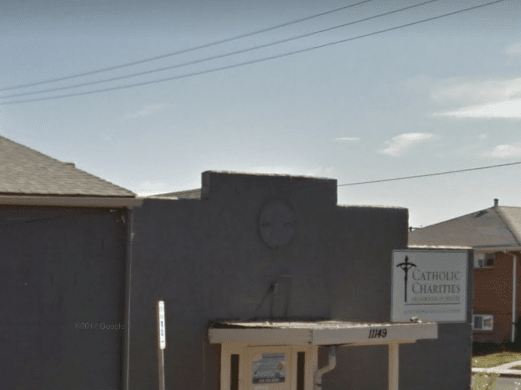 If you know of any details, volunteer information, website, hours or more description information about Catholic Charities - Little Flower Emergency Assistance Center please add a comment (below the map on this page), with information. We will then display this for all visitors on this page.